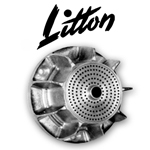 Litton surface mix burners are available in Standard, Swivel, and Ring configurations. The Quad Manifold includes four independent fuel inlets for separate control of the inner and outer flames on the Barracuda bench burner. This special manifold allows independent control of the outer flame when used with Foot Pedal Mechanism Model E2 (shown below). Gas and oxygen are fed to the burner's inner flame by two of the inlets, while gas and oxygen are fed to the outer burner flame from the foot-controlled outlet. 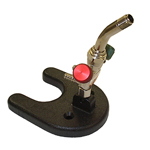 This allows the operator to instantly turn the outer flame on and off from the foot pedal. Oxygen with an Annealing Burner. 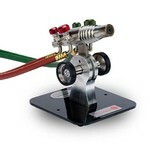 The Bravo Bench Burner was designed specifically with the needs of the artistic flameworker in mind. A dual purpose torch, it will work easily with both soft and borosilicate glass. Bethlehem's Bravo is one of the hottest new torches on the market today! Whether you're working soft glass or borosilicate, you'll be delighted with the infinite versatility of the Bravo flame. Made with the precision and quality of all Bethlehem burners, the Bravo's output is surface-mixed and whisper-soft. You'll find the torch itself is actually an artistic complement to your flameworking process. By varying the atmosphere of your flame, you can use your torch like a fiery paintbrush for shading and highlights. The razor-sharp center is excellent for creating small details. 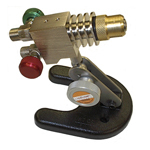 The outer flame transfers heat to your glass at lightening speed and with low line pressures. For marbles, sculpting, and vessels, this sleek new torch is both cost-effective and fuel-efficient. 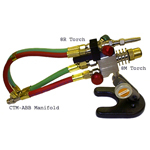 The National 6B Torch is ideal for dental labs or any bench top application. A nifty feature on the 6B is a 360° free rotating elbow, which has been made possible by including an O-ring on the elbow insuring a positive seal. A specially designed leak-proof "O" ring union permits the tip and elbow assembly to be rotated to any desired angle without the aid of a wrench. 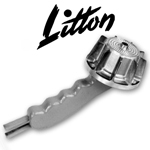 The elbow can still be set to a fixed position simply by torqueing down the nut. N-0 thru N-3: for propane/ natural gas & air combinations. OX Series & HTM Series: for propane/natural gas & oxygen combinations. The National 8M Torch used with natural gas or propane & oxygen offers versatility for anyone in glass working from bead making to quartz glass. The 8M comes standard with a swivel ball mounting on a stable, cast steel U-shaped base. The National 8M Torch allows both surface mix & pre-mix applications with the simple interchange of tips. The SM-5, SM-7 & SM-21 surface mix tips are easily interchangeable simply by twisting on & off (No Wrenches!). Pre-mix operation is just as easy with the PA-1 Adapter! 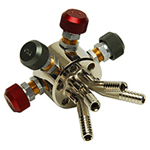 The PA-1 Adapter allows you to use most of National's natural gas or propane & oxygen tips.